Membership: Anaconda, Cobra, Cottonmouth, Sidewinder [all of Earth-20051 (see the Comments below)]. Purpose: To make society "feel their reptilian wrath." Affiliations: None. 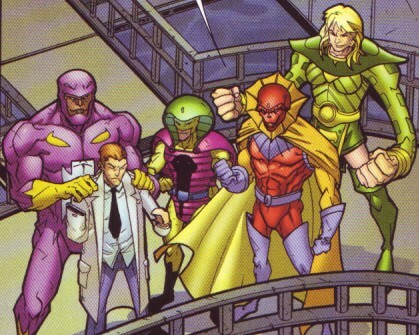 It should be noted that although another Earth-20051 Serpent Society exists, the two groups appear to be unaffiliated. Enemies: Lizard and Spider-Man of Earth-20051. Base of Operations: Unrevealed; active in New York City area. (Marvel Adventures Spider-Man#44 - BTS) - Learning about Dr. Curt Connors' Lizard serum, the Serpent Society kidnapped him, brought him to a water treatment facility, and forced him to experiment on innocents, resulting as what Spider-Man referred to as a Lizard Legion being created; infected humans who suffered a short-lived transformation into humanoid lizards. Under the Society's eyes, Connors refined that formula into a more potent version, apparently causing a permanent transformation. (Marvel Adventures Spider-Man#44) - Spider-Man burst in on the Serpent Society and Connors. Sidewinder confessed they wanted to poison New York's water with the formula, creating a paradise of mindless lizards which the Society could then rule over. The quartet fought Spider-Man, eventually defeating him, but Connors drank the serum himself rather than let the Society have it. As Connors transformed into a Godzilla-sized monster, Sidewinder teleported the Society away, satisfied that they city would feel their reptilian wrath. Comments: Created by Marc Sumerak (writer) & Jonboy Meyers (artist). Spider-Man mentions in this issue another Serpent Society, from Marvel Adventures The Avengers#11. Due to the massive disparity in powers, modus operandi, and nature, we assume there's no relation between the two groups. In Marvel Adventures Fantastic Four #25 (August, 2007) the Watchers identify the Marvel Adventures universe as #20051. We're assuming here that the Marvel Adventures Spider-Man and Marvel Adventures Fantastic Four universes are the same one, though at this point this is only an assumption, subject to future confirmation or disproving. Apparently the Marvel Adventures Spider-Man and Marvel Adventures Avengers are the same universe, as Spider-Man mentions in this issue the Serpent Society from Marvel Adventures The Avengers#11. To be very clear - these are other-univeral counter-parts of the Earth-616 Serpent Society, and care should be taken not to confuse them! Similarly, the Marvel Adventures universe's Anaconda, Cobra, Cottonmouth, and Sidewinder should not be confused with any of their other-universal counterparts. When Spider-Man interrupted the Society, Anaconda was one of those more active in fighting him. By extending her arms she deflected a dozen oil drums Spider-Man had thrown towards her, and she captured him by wrapping her arms around him. Anaconda appears to have superhuman strength, and the ability to extend her arms to at least three or four times their normal length. While she may have some of the other powers of the Earth-616 Anaconda, those have not yet been seen. Cobra fought Spider-Man, first kicking him and then being briefly knocked down after being punched by him. Unlike the Earth-616 King Cobra, this one appears to have the ability to stretch his legs and feet to superhuman distances; this gives him the ability to kick as a weapon. He was not seen to have any other powers. While extending his jaws to bite or intimidate Spider-Man, Cottonmouth was hit in the face and mouth by a wad of Spider-Man's webbing. He soon ripped it off. Like the Earth-616 Cottonmouth, this one appears able to extend his jaws for the purposes of biting his foes. Given that he was able to remove Spider-Man's webbing, he apparently has superhuman strength as well, though this may be only in his jaws if he chewed, rather than pulled, the webbing off. Apparently the Society's leader, Sidewinder stayed out of the battle with Spider-Man. Once Connors transformed into the Lizard, Sidewinder teleported himself and the others away. 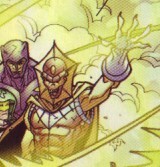 Though apparently similar to Earth-616's Sidewinders, those similarities are superficial. This Sidewinder can teleport more than one person here (unlike on Earth-616) and has a notably different visual effect when he teleports (seen in image at left). While on Earth-616 Sidewinder's "face" is a mask, here it appears to be his actual face, complete with very sharp fangs and a very skeletal appearance.